Here it is at long last — the final cover for my first picture book, Leaping Lemmings! I won’t go into all the details that took this book from first draft to final cover, but I would love to thank illustrator Nicola Slater and Artistic Director Meredith Harte (of Sterling Children’s Books) for all their amazing work creating this cover and the bright, delightful illustrations within. Nicola’s work and artistic eye perfectly highlight this story. So what’s the story? Leaping Lemmings is about one independent lemming who won’t jump off cliffs with his friends. It’s a funny book about peer pressure and thinking for yourself. You know, like an artist would. 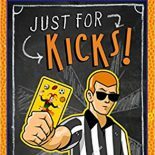 This entry was posted on April 5, 2016 by johnbriggsbooks in Books, Children's Books, Leaping Lemmings, Picture Books, Uncategorized and tagged book covers, children's books, illustrations, Leaping Lemmings, picture books.